The Resettlement of the Indo-European, Türkic, and Finno-Ugric tribes in Eastern Europe. – The Resettlement of the Indo-European, Türkic, and Finno-Ugric tribes in Eastern Europe. The Finno-Ugric and Samoyed Tribes. Map of the areas of forming Nostratic languages. Dravid. – Dravidian, Ind-Eur. – Proto-Indo-European, Kartvel. – Kartvelian, Turk. – Türks, Ural. – Uralic. The Indo-European, Türkic, and Uralic tribes were among the communities of farmers advanced northward looking for new settlement places. They left their Urheimat in the 6th mill. BC and gradually reached Eastern Europe. The Indo-Europeans were moving first, as they had an extreme nort-east position in the home land, the Uralian and Türkic tribes moved behind them. In the V-IV cent. BC. in Ukraine there were such Late-Mesolithic culture: Kukrek, Murzak-Koba, Hrebenyky, Janislawice, Donets, and types of monuments of Studenok and Platovsky Staw (see the section The First Neolithic Tribes in Eastern Europe). Below is a map of the ethno-cultural situation in Central and Eastern Europe, compiled by L.L. Zaliznyak, on the eve of the arrival there Nostratic tribes and described as PIE base. In fact, Proto-Indo-Europeans has been created only Donets culture, and later they migrated under pressure by the Turks to the area of Janislawice culture. In addition, in the Mesolithic the Finno-Ugric peoples were yet not on the the territory noted on the map. This area between the Volga and the Don Rivers was settled by tribes of Ural linguistic identity, which were followed after the Turks, and later divided into the Finno-Ugric and Samoyed peoples. Ethno-cultural situation in Central and Eastern Europe in the V-IV century. BC.. The orginal of the map (ZALIZNIAL L.L. 1995-5: 11. Fig. 5) was colored by the author. Late Mesilithic: 1. Leinen (Leihen ? )- Warten (?) culture. 2. Oldeslohe (Svadborg? Maybe Svendborg). 3. Chojnice-Pieńki. 4. Janisławice. 5. Sites of finds of Janisławice edges. 6. Donets culture. Neolithic: 7. Comb Ware culture. 8. Funnelbeaker culture. 9. Balkan Neolithic. 10. Middle Eastern populations. 11. Proto-Kartvelians (wider – Caucasoids -V.S.). 12. Proto-Finno-Ugrians (Uralians). Unfortunately, the author of the original map does not mention anywhere in the texts of his works about cultures outside Ukraine and at the same time gives them sometimes several different names. Further we will build our arguments on the results of own research. However, before further narration, there is a need to make some adjustments. The controversial question of the genetic relationship between Türkic with Mongolic and Tungus-Manchu according to obtained results should be solved negatively, since the formation of the proper proto-languages took place in different locations. 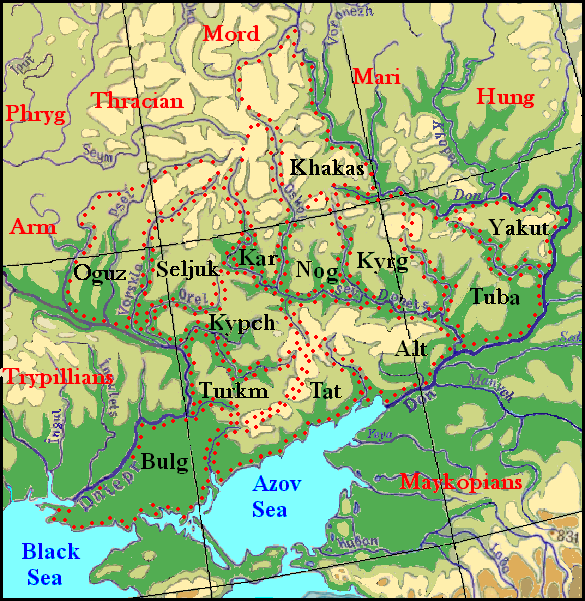 Whereas the Türkic proto-language was formed together with other Nostratic in Transcaucasia, the formation of Mongolic and Tungus occurred in the Far East in the Amur River basin along with Korean and Japanese parent languages. In addition, the relationship between the Turkic and Mongolшс languages is contradicted by the absence of convincing correspondences between the words of the lexical nucleus. As Sir G. Clauson pointed out, the basic words, that is, the numerals, the basic verbs like "to say, to give, to take, to go" and so on, the basic nouns like "food, horse", and the basic adjectives like "good", "bad" are entirely different in the Turkic and Mongolian languages (CLAUSON, SIR GERARD, 1956: 182). Meanwhile, the lexical core of any language consists of the oldest words and just their similarity with the words of another language can speak of a genetic relationship. This is especially true for numerals. Realizing the importance of the similarity of numerals, some supporters of the Altai origin of Turkic languages try to pull them far-fetching. For example, they find similarities between OTurk otuz "thirty" and Mong. gurvan "three", but similar phonological freaks are more like a some linguistic equilibration. Of course, Altaic Urheimat of the Turks seems to be for many self-evident truth, but on close examination this self-evidence is imaginary, because it proceeds from a scientifically unproved assertion developed into the theory by sophistical reasoning. 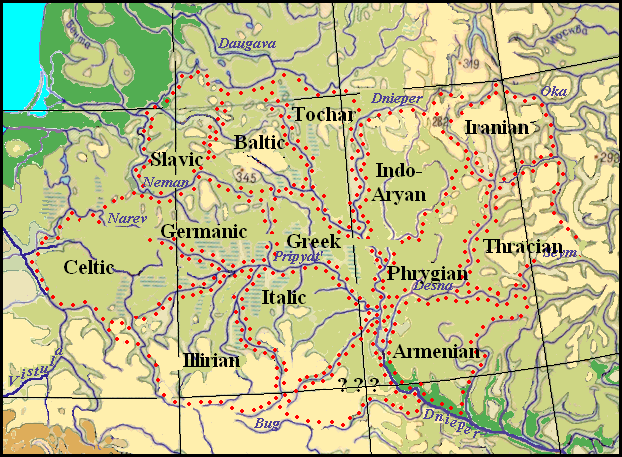 Left: The Resettlement of the Indo-European, Turkic, and Finno-Ugric tribes in Eastern Europe. Legend: Nostratic peoples: A-A – Abkhazo-Adyge, Dag – Dagestabians, Dr – Dravidians, Kar – kartvelians, I-E – Indo-Europeans, NC – the speakers of North Caucasian language, S/H – Semits-Hamits, Trk – Türks, Ur – Uralians. Indo-European peoples: Arm – Armenians, Balt – Balts, Gr – Greeks, Germ – Germanic, Illirians, Ind – Indo-Aryans, Ir – Iranians, Ital – Italics, Celt – Celtic, Slav – Slavs, Toch – Tocharians, Thrac – Thracians, Phrig Phrigians. Finno-Ugric peoples: Est – Estonians, Fin -Finns, Hung -Hungarians, Khant – Khanty, Lap – Sami, Mans – Mansi, Mord – Mordvinians, Udm – Udmurts. Turkic peoples: Alt – South Altaians, Bulg – BUlgars, Yak – Yakuts, Khak – Khahasians, Tat – Tatars, Trkm -Turkmens. Many other linguistic facts contradict Asiatic origin of Türks but scholars try to find them whichever explanation if only not refuse conventional views. Even Clauson, an opponent of the genetic relationship of the Mongolian and Turkic languages, having examined the common Türkic name kendir for hemp (Cannobis), noted: "Unlikely to have been an indigenous plant in the area originally occupied by the Türks and probably an Indo-European (?Tokharian) l.-w." [CLAUSON, SIR Gerard, 1972]. It seems to be a strange thought considering the currency of this word in Türkic languages and its absolute absence in Indo-European languages. The Türkic languages are characterized by great similarity between them. This phenomenon is explained by the enough small territory occupied by Türks during forming their particular languages. The exchange with new invented and loan words could embrace large parts of this territory contrary to the Indo-European and Finno-Ugric languages. It is suggested.., that it is a loan-word from Latin virga ‘a rod, a stock’ obtained through Middle Persian but there does not seen to be any trace of the word in Persian, and the theory is importable [ibid]. If Hungarian virgácz “twig, birch” which borrowing from Latin is doubtful can be referred to these words than Hung virgone “agile, nimble, lively” and Chuv virkěn “to race, rush” also correspond to them. Obviously, it is a wandering word which traces are present in many European languages but not in Asianlanguages having different but similar meaning (e.g. Erzya verka “quick”, Rus birka and other similar Slavic words “smal twig”, “catkin”, Ger Birke “birch”, Hung virag “flowers”, Kurd wurg “lively”). If the creators of the Tripilla culture were Semites, the all these words can have an origin word similar to the Ar firh and Heb. perax "flower". Then Lat virgō "virgin" of unknown origin (W.) should be referred here (cf. "deflowering"). It seems that so far none of turkologists not paid attention to the striking similarity of Yak. (d'axtar) "woman" to the Indo-European words ​​meaning "daughter" (Ger. Tochter, gr. τυγατηρ, O.I. duhitar, etc.) Yakut word in any case could not be borrowed from the Russian language on the phonetic reasons and may be additional evidence of the presence of Ancient Türks in Eastern Europe. However, in the etymological dictionary of Türkic languages ​​(SEVORTIAN E.V. 1980: 245-247) provides an ancient Türkic root doğ-, producing word meaning "to be born", "bring forth, bear", but in the relevant article of the dictionary is not given any Yakut match. Thus, the similarities between the Türkic and Mongolian languages have to be explained by the later prolonged contacts, obviously, the same is true for the Tungus-Manchurian languages. Such statement does not give reason to doubt the relevance of Svitych Illich's data, who added facts of the Mongolian and Tungus-Manchurian to the Altaic language also, as he mainly based on the materials of the Türkic languages. Linguistic facts of the Mongolian and Tungus-Manchurian languages in most cases duplicate Türkic ones in his data. When they have no Türkic matches, they seem random, as their correspondences are scarce in other Nostratic languages. The same applies to the facts of language Samoyed languages in relation to the Finno-Ugric peoples, however, denying their genetic relationship is still no reason, but further study of the Uralic languages would be limited to the Finno-Ugric languages, and the study of their relationship with the Samoyed should be separate theme. To be fair to say that the mainstream of European science is now adoption an idea about "abcense of relationship between Türks, Mongols and Tungus", as I was informed by one of the Russian Türkologist in a private letter. Forestalling something ahead in grounds, we present below the map of the settling of the Indo-European, Finno-Ugric, and Türks peoples on the Eastern European plain. The more detailed description of defining areas of ethnic settlements will be done in the following subsections. Map of the Areas of forming Indo-European languages. The whole Finno-Ugric territory is clearly limited by the Volga and Don River, playing the role of natural boundaries, as powerful water obstacles. Only Mordovians moved to the right bank of the Upper Don that is where it is easy to be crossed, came close to the Indo-European settlements separated of them by the Oka River. As the Indo-European space, the Finno-Ugric territory also has "empty" habitats. They are at least two – to the south of the Oka River and on the right bank of the Volga. You can assume that the Finno-Ugric tribe known as "Meshchera" populated the first "empty" area in the neighborhood with Finns, Mordvinians, and Cheremisses. Due to the characteristic form of the graphical model of the Türkic languages, it was pretty easily to find a place for it on a map, but not there where it could be assumed according to prevailing actual views. It was impossible to find something suitable either on the Altai Mountains, where mountain ranges could play the role of natural borders of habitats or near extensive network of the Ob and Yenisei Rivers. Diagram superimposed on the map only within the Dnieper-Don-Interfluvial area, where the characteristic bend both rivers suggests how to arrange the resulting scheme (see the map). Such location was accepted taking into account that the Yakuts had to colonize the extreme eastern area, and Bulgars – the extreme west of the common territory. 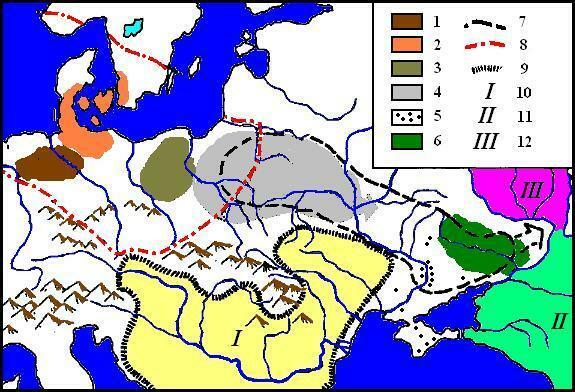 Valentyn Stetsyuk – The Resettlement of the Indo-European, Türkic, and Finno-Ugric tribes in Eastern Europe.